The Eskort Family Recipe competition introduced us to a world of flavours and tasty combinations – and while it was delicious, choosing a winner was no easy task. Ultimately our judges found that bacon really does make everything better and creating a winning dish doesn’t have to mean pulling a rabbit out of a hat. After a last-minute entry by chance, Grace Tembo’s bacon and mushroom pasta recipe won her the second prize! Grace gushed about why she entered: “A friend of mine knew I loved cooking and bacon equally so she sent me a link to the competition and thought it would be cool if I entered. For sharing her recipe and coming out tops, Grace won a R1 000 Spree voucher as well as a copy of the Eskort 100 years 100 recipes book and a digital subscription to DRUM magazine. Her recipe will also feature in an October issue of DRUM magazine. “I really wanted to share my dad’s recipe with the country because it’s my favourite meal and I'm sure other people would enjoy it too,” Grace said on why she shared this particular recipe. Preach! Try Grace’s for yourself. 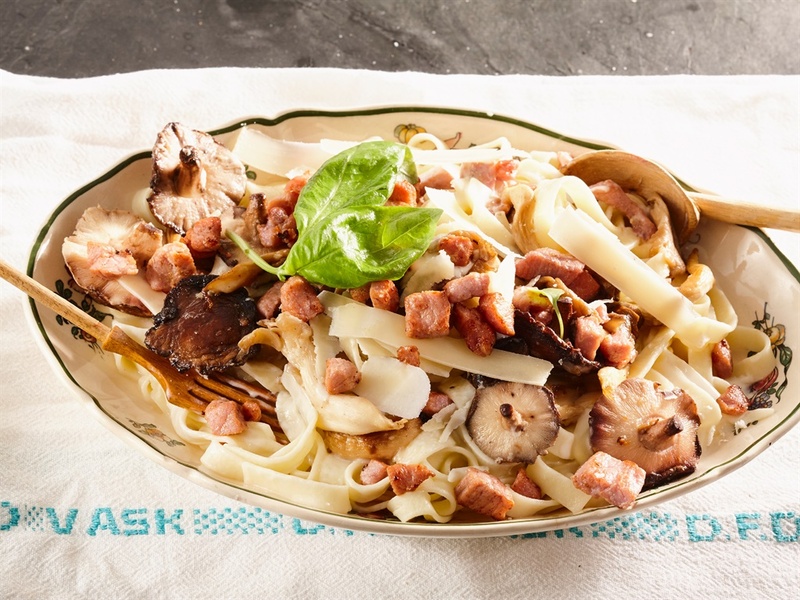 “Grace Tembo uses diced bacon with mushrooms to make this tasty pasta in a flash,” says food editor Carmen Niehaus. 1 Cook the pasta according to the packet’s instructions. Drain and set aside. 2 Fry the bacon until light brown. Add the garlic and ginger as well as the mushrooms and fry until e soft. 3 Add the cream and stock and stir until the sauce slightly thickens. As you stir, add the cheese. 4 Add the mixture to your pasta and mix together. 5 Serve with Parmesan and garnish with fresh basil. The dish is best served hot and the more cheese the better! How does it feel to be the second runner-up in our cooking competition? “I came out second out of hundreds of people – that gives me the confidence to better my cooking skills and enter more [competitions]. I am so excited! I couldn’t believe I actually won because some of my friends would tease me and say I can’t cook but look at me now! #mamaimadeit!” Grace said.